Advanced cold compression extraction method is followed to obtain Lime Oil from a distinctive small shaped fruit that resembles to lemon in terms of appearance. The oil is procured from the peels of that fruit in dried or fresh form. This essential oil is known for its numerous medicinal values and is used to treat cold, cough, sore throat, asthma, sinusitis, bronchitis and flu. This oil is used to treat arthritis and depression. Its antioxidant enriched content and detoxifying properties strengthen immunity system and flushes out toxin from body. Lime Oil is a good remedy for muscle pain and joint pain. Lime oil contains elements like fenchone, b-pinene, a-pinene, borneol, linalool, 1,8-ceneole, geranyl acetate, limonene, traces of neral acetate, citral, terpinene and myrcene. Lime oil is compatible with clary sage, ylang-ylang, neroli and lavender oils. Lime oil is also referred as West Indian lime oil. 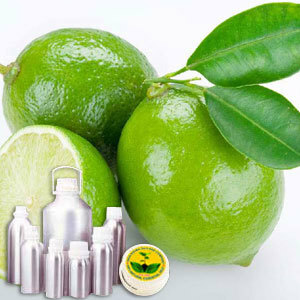 The refreshing smell of Lime Essential Oil has rejuvenating effect on stressed mind. This oil has proven result in curing flue, sore throats and colds. It is an effective remedy for asthma, bronchitis, sinusitis and cough. Its antioxidant properties help to reduce aging related dark spots and are effective in preventing formation of wrinkles. This oil is used to produce natural disinfecting formulation and insect repellent. It is a good remedy of psoriasis.